The Lowdown: Excellent adaptation of a true-life story of survival at sea, boasting an outstanding performance by Shailene Woodley. Director Baltasar Kormákur’s Adrift tells the true story of a young couple who, in 1983, unwittingly sailed a small yacht directly into the path of Hurricane Raymond en route from Tahiti to San Diego. Starring Shailene Woodley and Sam Claflin, the gripping film should play well to a wide demographic range. Part dewy romance, part intense survival story, Adrift unravels its story in non-linear fashion. This canny editorial decision avoids any chance of the first half being top-heavy with young love, or the second half becoming bottom-heavy with high-seas peril. The balance is agreeable, resulting in a study of contrasting moods. Do yourself a favor: if you aren’t already familiar with the actual events in the lives of Tami Oldham (Woodley) and Richard Sharp (Claflin), then definitely don’t read up on it prior to experiencing the film. You won’t be doing yourself any favors by knowing more about the real-life events than you already might. 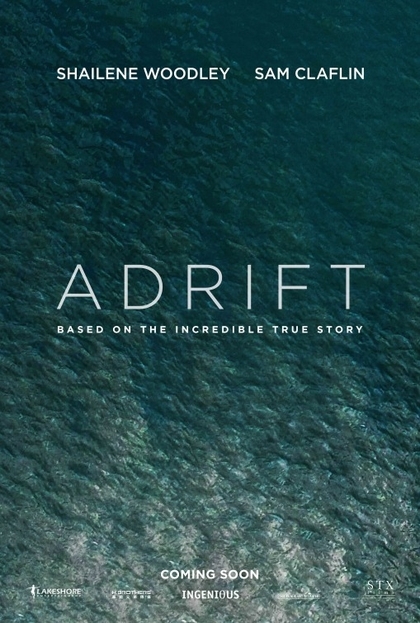 Adrift is adapted from Tami Oldham’s memoir Red Sky at Mourning: A True Story of Love, Loss, and Survival at Sea, and anyone who’s seen the trailer knows that Tami and Richard survive the storm only to face an interminable period of time lost at sea. With Richard severely injured, Tami is left to fend mostly for herself—despite being a far less-experienced sailor than Richard. As such, this is pretty much Shailene Woodley’s show, and she owns it. She’s onscreen for nearly every frame of film, fully committed to a physically and emotionally challenging role. We see her as a free-spirited 24-year-old, arriving in Tahiti having essentially abandoned a troubled upbringing in San Diego. If it seems that the scenes of her blossoming romance with equally free-spirited Richard are a bit too blissful to be true, that’s kind of the point. There’s an admittedly Nicholas Sparks-esque level of impossibly glowing, PG-13 romance that, on its own, wouldn’t make for much of a drama. It’s the way that their doomed sea voyage shatters that idyllic dream that lends Adrift its bracing, almost disorienting realism. Tami breezes into Tahiti without so much of a plan for next week, let alone the rest of her life. It’s unclear how Richard finances his lush, seagoing lifestyle, but when he and Tami fall in love they clearly believe they’ve discovered their purpose. Only the most cynical viewers are likely to resist their youthful optimism. As we’re yanked back-and-forth between their fairy tale and the aftermath of Hurricane Raymond, director Kormákur (also responsible for 2015’s true-life disaster story Everest) reminds us that nothing in life is permanent. As a fend-for-yourself tale of isolated survivalism (Tami is essentially on her own, given Richard’s immobilizing injuries), Adrift scores higher than, say, Ridley Scott’s absurdly over-praised fantasy The Martian. Not for nothing did that film win Best Comedy at the Golden Globes—its improbable (impossible, actually, in some cases) circumstances resulted in an unintentional chucklefest. Adrift isn’t without moments of humor (though most of them occur in the pre-storm flashback sequences), but it focuses on the grim prospects of one inexperienced sailor attempting to navigate a crippled vessel across the Pacific. Matt Damon’s incessant smarm as a lonely-but-lucky astronaut is no match for the true grit of Woodley’s lovestruck passenger who transforms into a innovative captain overnight. With any luck, summer moviegoers will take a break from superheroes and spaceships long enough to take notice.